INSPECT ALL COMPONENTS FREGUENTLY FOR SIGNS OF WEAR OR DAMAGE! -Optional overload indicator handle available. 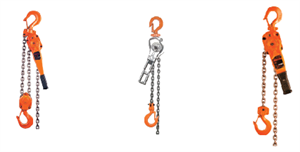 The overload handle will alert the operator when the hoist is operation beyond the rated capacity. We offer inspections and mobile proof test services for product verification, break testing, and load testing to ensure compliance for all lever chain hoists we sell and repair. Our mobile proof test services are available throughout the United States. In addition to our mobile load testing services we have stationary test beds to service Oklahoma, Texas, Kansas, Wyoming, North Dakota, New Mexico and all surrounding areas.